Home → Foundation & Wall Repair → Bowed Basement Walls? BWI Can Help! Have you ever examined your basement block foundation wall only to notice it has more curves than a country road? Bowing walls are not all that uncommon in a block foundation wall. Simply stand at one end, put your eye close to the wall and look toward the other end. Or, put a straight edge top to bottom and see if there is any separation or daylight in the straight edge. A bowing wall will usually show quite easily. A physical property of a block wall is that it is designed to support the downward pressure or the weight of the house structure, which can be anywhere from 20-60 tons depending on the size of the home. The side pressure (or lateral pressure) is not the strength of a concrete block wall foundation. Often times, these block walls foundations are not far from the envelope of their capacity to begin with, nevermind the New York State environment. 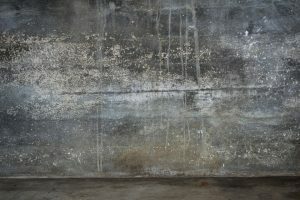 The wide range of temperatures and weather conditions in NY can cause problems with your basement walls. The extreme cold snaps in winter can cause the frost to push far and deep. If you notice a horizontal crack spanning the long wall of your block foundation, then you have identified a frost line crack. In the winter into the spring melt, you could even notice this crack expanding as spring melts cause water to fill the backfills. This causes excessive side wall or lateral pressure, which moves your foundation inward. These are warning signs that should alert a homeowner to take notice and, consequently, seek feasible measures to repair. es, you can see a white residue usually forming a horizontal line somewhere along your block foundation. This is equivalent to a high water mark in a flood zone and the white that you see is the lime that is in your concrete block. This process of deterioration weakens both the lateral integrity and the supporting weight of the of foundation wall. Over time, the wall will begin to bow. There are different ways to treat a bowed basement wall. There are several common repairs out there to remedy this problem. Some contractors install unfashionable support pillars with the intent to brace the wall hoping to give the extra lateral support they need. This method does not always work. Often people will hear a snap or bang, only to find out that these support pillars snap at the same place where the pressure crack from the bowing wall occurred. Some contractors construct a smaller block wall at the lower course of the concrete block wall designed to give extra support. However, if you wall is holding or retaining water in the hollow cores, this procedure will only insure the continual build up of water. Hence, the hidden deterioration process still going on inside your concrete block wall. Removing and replacing walls is costly. This method also requires tearing up your lawn, overhangs, driveways, sidewalks and landscaping. Most of the time, none of this is covered under your homeowner’s policy. BWI offers a solution for bowed walls from Fortress Stabilization Systems. A simple remedy offered and licensed by Basement Waterproofing, Inc. is the installation of Kevlar straps. These straps are installed every 3-4 feet. Once bonded to a concrete block foundation, they will give the common block foundation the strength of a poured wall. As a result, they are the most cost effective repair our there and simply one that not only makes sense, but actually performs as is advertised. The company will guarantee that once the Kevlar straps are installed, the block wall will not come in any further than it currently is and will continue to hold for the life of the home. Demonstrations can be viewed on the Fortress Stabilization System website – seeing is believing, and knowledge is powerful to the homeowner in making the proper decision for money spent for their home repairs.